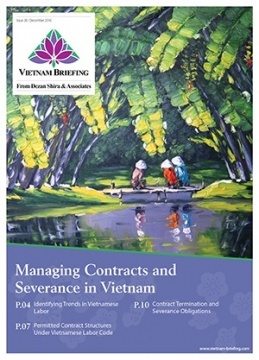 While Vietnam’s evolving economic landscape presents significant staffing challenges, a firm understanding of contracting laws and decisive action on the part of human resource managers can effectively safeguard and manage these issues as they arise. In this issue of Vietnam Briefing, we discuss the prevailing state of labor pools in Vietnam and outline key considerations for those seeking to staff and retain workers in the country. We highlight the increasing demand for skilled labor, provide in depth coverage of existing contract options, and showcase severance liabilities that may arise if workers or employers choose to terminate their contracts. Vietnam is undergoing a significant transformation in economic development, moving from conventional production of low cost goods towards the output of more technologically intensive products. While presenting significant opportunities for foreign investors, this has simultaneously created a strain on domestic labor markets. With a finite pool of skilled labor, now more than ever before, investors are exposed to issues stemming from the sourcing of qualified talent and the retention of existing workers for the long term. Although changes within Vietnam’s economic and production landscape do present challenges, a firm understanding of contracting laws and decisive action on the part of human resource managers can effectively safeguard and manage these issues as they arise. To ensure that these dynamics are minimized, it is of critical importance that investors maintain an understanding of Vietnam’s existing labor laws as well as employ systems of monitoring to catch and assess new legislation as it is released. Dezan Shira & Associates has a growing team of human resource specialists throughout Vietnam providing our clients with years of combined experience in assisting foreign enterprises navigate and effectively manage staffing and retention issues in the country. For questions on how to best optimize contracts, manage hiring, and navigate issues of severance, please contact us at vietnam@dezshira.com.